During the summer months, our dedicated delivery team (pictured below) have their trucks on the road seven days a week. We strive to keep our customers stocked with product. We offer a wide range of rentals. We offer rental of ice chest and ice pup trailers. Call for availability. 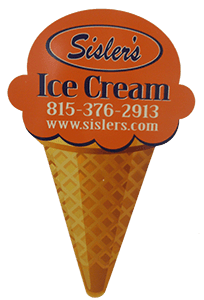 For a LIST OF RETAILERS that sell Sisler's Ice Cream, please scroll down (below photo). We pride ourselves on the service we provide to our customers. If there is anything we can do to assist you in your business, please feel free to give us a call. Tampico Tampico General Trading Co.